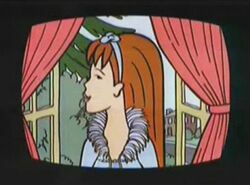 "Monster" was the sixth episode of the second season of Daria (episode number 206). It first aired on MTV on March 23, 1998. It was written by Neena Beber. That's not the end of Daria's cinematic experience, however, as she and Jane run into Mr. O'Neill at a local movie theater. While getting a ride home (reluctantly, thanks to a sudden rainstorm), Daria inadvertantly gives Mr. O'Neill a suggestion for a class project: students will team up to create their own movies, as an exercise in "living literature". Daria and Jane team up (naturally), while Jodie, Mack, Kevin, and Brittany give it a go. Brittany wants to film a love story -- with herself as the star, of course -- while Jodie would rather make a documentary about a local Food Lord strike. Jodie's suggestion wins out, but Kevin winds up getting beaten up by the strikers when he tries to cross the picket line to buy Brittany a snack. Meanwhile, Daria and Jane try several ideas -- "tree cam", an art film, and an existential puppet show -- before hitting upon the perfect idea when Quinn asks to borrow one of Daria's outfits for a "fashion don'ts" party: they'll make a documentary about a day in the life of a shallow, self-absorbed, yet popular teenaged girl. Quinn readily agrees, but has no idea that their ultimate plan is to humiliate her. Unfortunately, they doesn't get the chance -- Quinn acts all nice and perfect and nauseatingly sweet -- until Quinn finally loses her cool at the mall, when she suspects that Daria is zooming in on her "perfect pores". She and Jane start editing the video, and are salivating at the prospect of Quinn's total humiliation, when Helen steps in and tries to kick-start Daria's conscience. It doesn't work... until Quinn tells them that she's looking forward to seeing her video, and hopes that it doesn't make her look stupid because sometimes she thinks that. In a rareunguarded moment, the nervous Quinn admits that sometimes she's discontented with what she and her friends talk about and knows it's stupid, but being attractive and popular is the (only) thing she knows she's good at. Daria's conscience causes her to edit "The Depths of Shallowness" to show Quinn in the best possible light. To her and Jane's mutual annoyance, it makes Quinn more popular than ever. 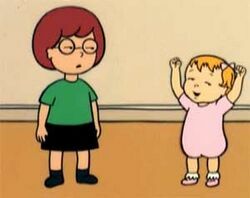 Daria did ballet as a kid! Even Helen finds this hard to believe, remembering it was Quinn who did it and Daria who laughed when her sister fell over instead of vice versa. Kevin and Brittany have been to a live Rocky Horror Picture Show screening, where they wore each other's underwear. Quinn is currently dating Zachary but doesn't bother to remember his name - she was dating Larry but his car crashed, while Zachary has access to his mother's. Her suggestion he ask "Theresa at Junior Five" what to buy her will backfire - "Love is a Way Too Many Splendored Thing" reveals the two started dating. "Mad Dog" Morgendorffer was the one recording Jake's childhood onto home movies. This is a new facet to the man - though he also recorded instances of him berating his son. The film Daria's off to see is the 1930s Soveit art film, Andre Sakarynsky's Last Meal (which isn't real). Due to backgrounder budget, a lot of other teenagers went to see it! Kristen Bealer's "Tapped Out]" depicts Daria's time in ballet. This page was last edited on 23 April 2018, at 14:01.